Building simple workflows may come in handy in certain situations, but what if you need to build complex ones? That’s where filters come into play. For example, you may want to share a lead upon submitting the form only if he/she resides in Miami. Or you want to add 10 points to a lead upon opening your marketing email, but only if the lead came from your website. By adding AND and OR conditions, you can build complex workflows that match your requirements. You can add as many conditions as you want while building your workflow(s). The more filters you use, the more complex the workflow becomes. Deep filtering is especially useful when it comes to creating workflows with specific conditions. Business scenarios may be completely unique, that’s why you need to use filters while building the workflow. Flexie CRM allows you to add many filters and execute actions based on them – no matter how complex your business scenario might be. By adding AND and OR conditions to your workflow, you make the whole automation process a lot more efficient. Even the most complex business scenarios can be tackled by using filters. But wait, there’s a lot more! 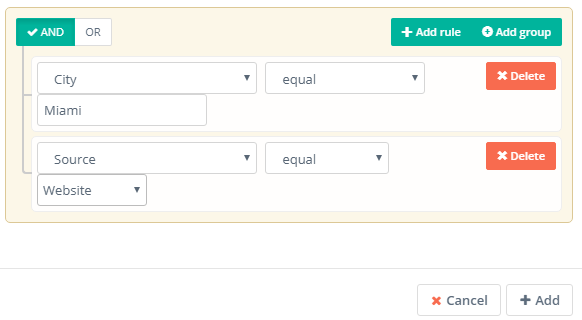 In addition to using complex filters to build workflows, you can also use filters to find exactly what you want. For example, you can use filters to find only the leads that come from referrals. By using filters, you save precious time that can be used for other tasks. You can use filters to also find specific deals, contacts, accounts and other records. Filtering is a huge time-saving method. Because at the end of the day, you’re not looking only for ways to cut costs and increase productivity; you’re trying to do these in the shortest amount of time possible. And that’s what deep filtering in Flexie CRM does. More time spent on doing actual work, less time spent on trying to find what you need.